[TV] How to use Anynet+? Anynet+ is a function that enables you to control all connected Samsung devices that support Anynet+ with your Samsung TV’s remote. The Anynet+ system can be used only with Samsung devices that have the Anynet+ feature. To be sure your Samsung device has this feature, check if there is an Anynet+ logo on it. 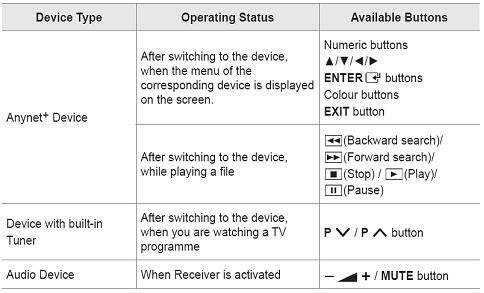 • The Anynet+ function only works when the active source on the TV remote control is set to TV. • The button works only while in the recordable state. • You cannot control Anynet+ devices using the buttons on the TV. You can control Anynet+ devices only using the TV remote control. • The TV remote control may not work under certain conditions. If this occurs, reselect the Anynet+ device. • The Anynet+ functions do not operate with other manufacturers’ products. • The operations may differ depending on the device.